Size: L, Color: Ride/Light Steel (Grey) is currently out of stock! 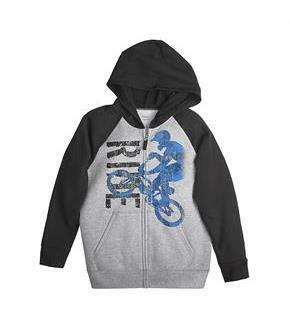 Size: M, Color: Ride/Light Steel (Grey) is currently out of stock! Size: S, Color: Ride/Light Steel (Grey) is currently out of stock! He loves to bike down the dirtiest trails. You love a hoodie that keeps him warm and fights off odor.FreshIQ™ advanced odor protection technology attacks the odor-causing bacteria in his clothing that causes his clothes to smell – so now he can feel fresh all day.7.3-oz. super soft fleece gives him warmth without the weight for year round wear.This classic hoodie includes hood with ribbed trim, pouch pocket and full zip front.Large metal zipper pull makes zipping up easy.Straight hem.Tag-free for itch-free comfort.